CARP BLOG (Mon): Winter success for Korda team! THIS week’s Carp Blog on the Angler’s Mail website comes from James Armstrong of Korda Developments. As usual, some top carp fishing advice. If you enjoy the blog, share it with your friends on Facebook and Twitter by clicking the icons above. And check back for all our daily blogs. Winter success for Korda team! WITH the temperatures still very mild for the time of year, anglers are still hitting the banks and some lovely carp are being caught from all over the country. “In early December I was fortunate enough to be offered a winter ticket for Bundy’s Pit. To say it’s deep would be a massive understatement – apparently it can reach staggering depths to over 60ft in places, which is a head banger to say the least. “From my experience, it seems that lakes with extreme depth to them, tend to fish a little later than your standard depth venues. The theory being it takes longer for it to cool off. “I didn’t get off to the best of starts, as I managed to lose my first two bites during a couple of December trips. “Before I knew it, Christmas was here and my next trip wasn’t until early January. Luckily, the weather was still very good with temperatures into double-figures. Thankfully upon arrival to my next trip, I was greeted with the news that they were still getting caught. “To cut a long story short, I got into one of the pegs that fished towards the middle zone of the lake. I then quickly clipped up around some distance sticks to some marks I’d plumbed on an earlier trip. This was to avoid any extra disturbance. It was then just a case of flicking them out against the clips and putting three or four spods of Hybrid crumb over the top. “Rig-wise, I had reverted back to my tried and tested hinged-stiff rigs, after my earlier hook pulls. It’s a set-up I’ve used a great deal in the past and one that has served me well. “On the first morning, I bagged a couple of nice twenties, just on first light. On dusk, I had another bite, which unfortunately came adrift, but before I had time to sulk for too long, I had another two low-twenties in my nets. With all three rods having to be recast in the dark before 11pm, I decided to top up with some more bait, only three spods on each rod, which is more than enough as it was clear they were getting on it. “The next take came around 10am; I was instantly aware that it was pulling a little more ponderously than the others. So, I took my time and after it beat me up in the depths, I finally netted a lovely, long common. We’re also putting the finishing touches into our new free DVD, which will be an absolute masterclass in carp fishing. Filled with carp, loads of tips and new methods, this is set to be the best one yet! Keep an eye out for its release. 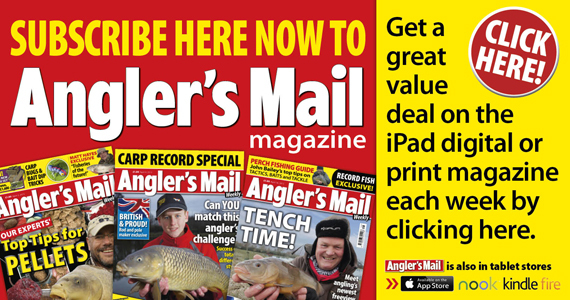 ANGLER’S MAIL’S NEXT BIG CARP BLOG WILL BE LIVE NEXT MONDAY.